The big advantage of staying in a ferry port is that it’s not as worrying. You can time your arrival in the queue to perfection. 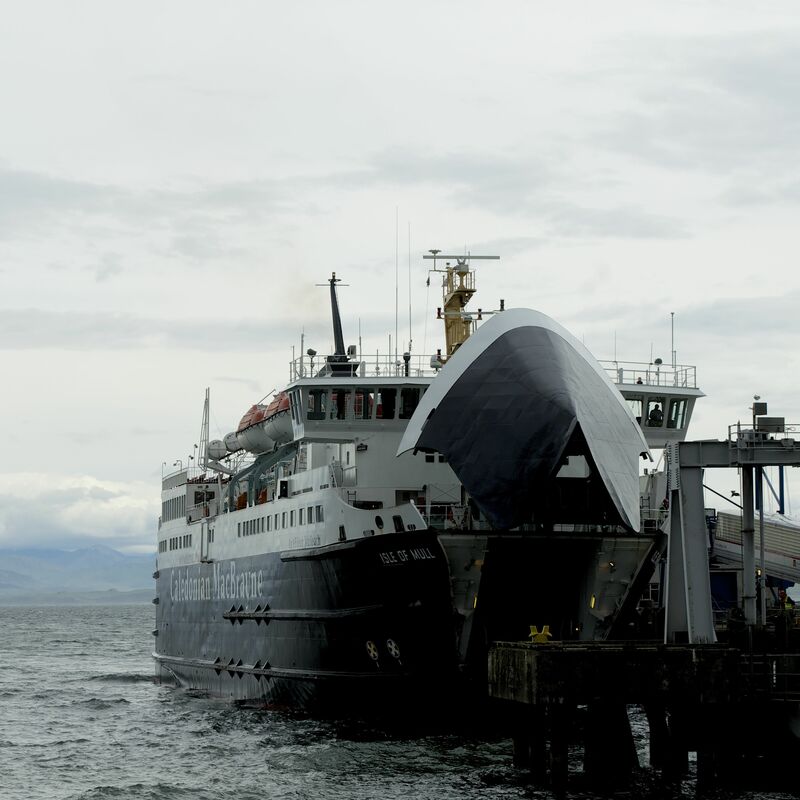 There was certainly no shortage of customers this morning – the usual mixture of cars, motorhomes and lorries – for the crossing to Oban on the Isle of Mull boat. As usual with CalMac, the loading was smooth and easy and we were relieved that this time Peter didn’t have to reverse on! The giant maw opens to swallow up its passengers! We were late leaving, however, due to the local bus being late bringing its passengers – I can’t imagine that happening down south. Once onboard it was a case of hunkering down in the lounge with its massive windows. On deck it was far too windy as Peter found out when he went out to take some pictures. 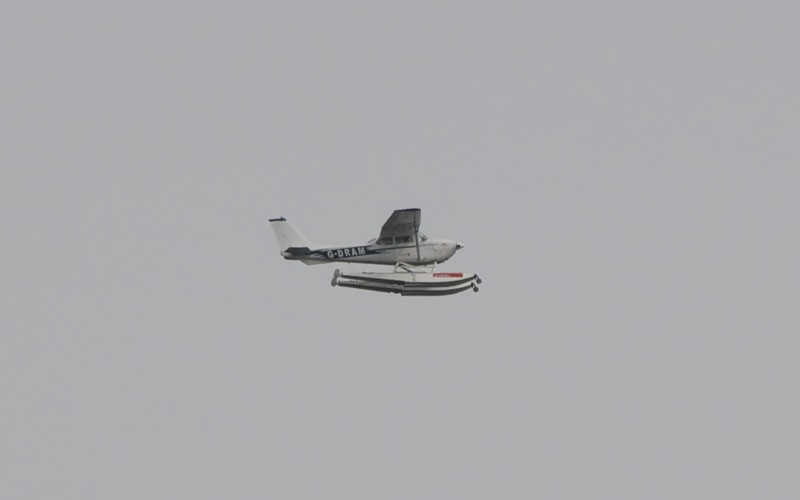 It’s just a 45 min crossing but there’s always something to see, including this sweet little seaplane with its “water skis” below. 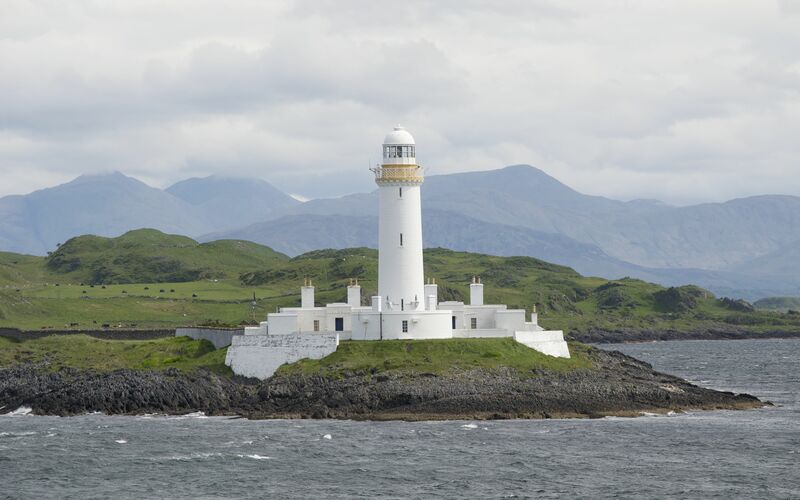 We passed the Lismore lighthouse which is located on Eilean Musdile and protects shipping in the Sound of Mull. The lighthouse was built in 1833 by Robert Stevenson and was automated in 1965. The beacon flashes white every 10 seconds and has a nominal range of 19 miles. Lismore itself is an island on the Lynn of Lorn, forming part of the Southern Hebrides, and is long and thin – 10 miles long by 1 mile wide. I do love the simplicity of the Stevenson lighthouses, particularly those by Robert. 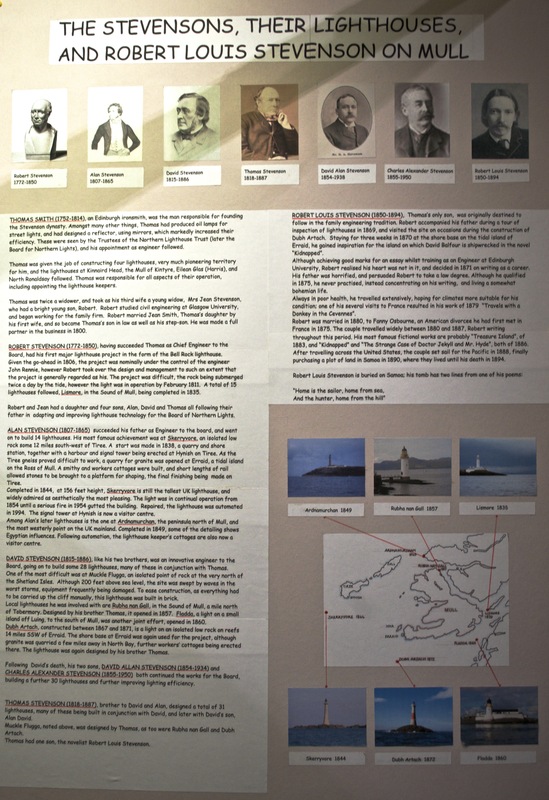 While in the Mull Museum the other day I photographed this information about the Stevensons. If you’re interested you can click to see a larger image. 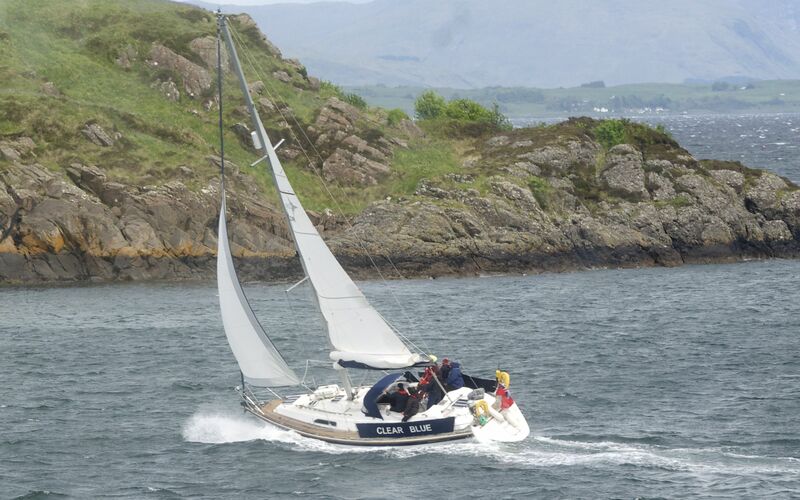 This small yacht was taking advantage of the windy conditions as we neared the coastline above Oban. Once back on dry land again it was time to stock up with a few groceries so we headed off to the local Co-op (that annual divvy must be building up!) and some diesel at Tesco which, surprisingly, was actually 2p cheaper than last year when we did the same (£1.36.9 pl for those interested in such minutiae). Today was always meant to be a relaxing one and we arrived at our overnight campsite, Seaview Camping & Caravan Park at Benderloch, a few miles out of Oban on Ardmucknish Bay, by lunchtime. 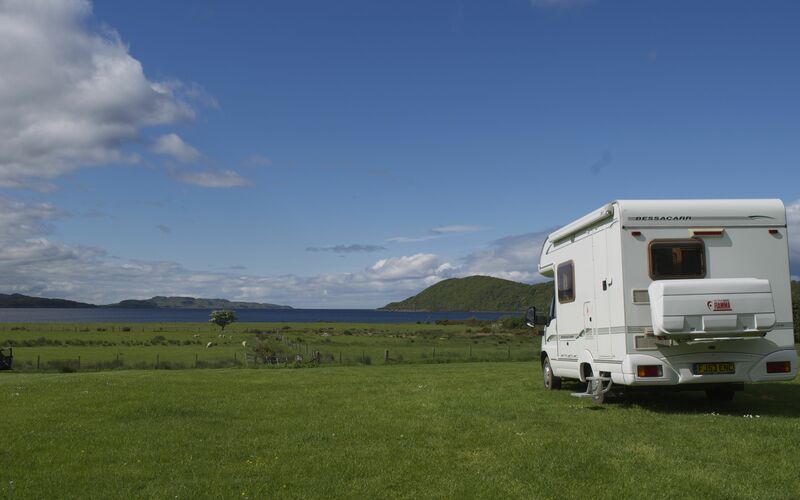 The young owner, Duncan, was friendly and led us to an extremely spacious pitch with far reaching views over the bay. I have to say that the afternoon went by in a haze as we both caught up on lost sleep. Good to just unwind and a break from difficult driving for Peter. 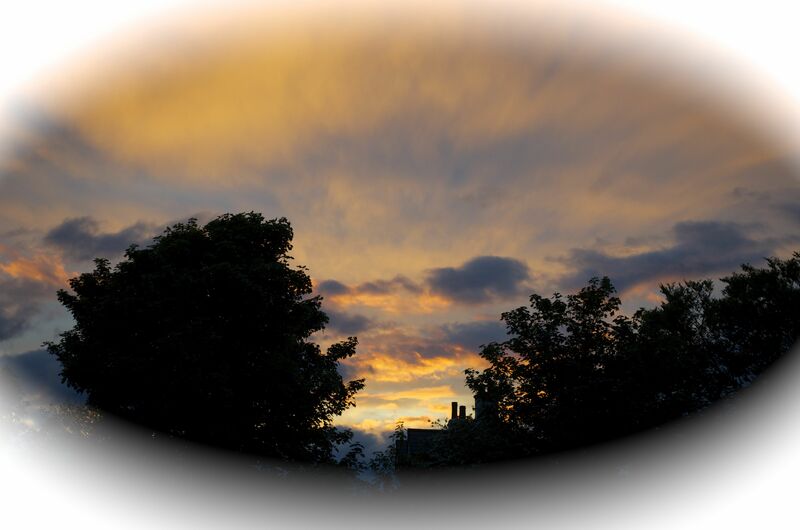 We Skyped Sally and family during the evening while the skies darkened and a colourful sunset set the seal on the day. It’s good to see the sunset you were talking about. You do have such beautiful views at the campsites you stay at. You have been so lucky with the pitches you’ve had on this trip, so far. Some of the views have been magnificent. I need a day to catch up on sleep too! I thought that the boat at the beginning was broken and it was about to sink. Why did you think it was broken Guy?